One of the quotes from yesterday's post was curious and I wanted to follow up on it, but that means looking at the Ross and Campbell Bridges first. This is the Ross Bridge, finished in 1836, a good ten years after Richmond's bridge. I was just going to post one photo of with a link to photos I've shared before. 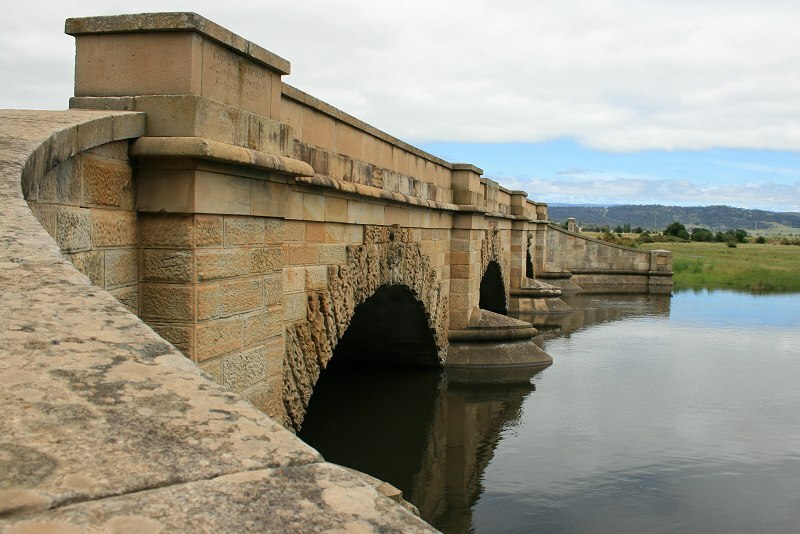 But then I was looking for some informationon the previous bridge and came across a document entitled Nomination for an National Engineering Landmark Revisited by The Engineering Heritage Tasmania Engineers Australia July 2006 (PDF) which has a curious bit in it about the carvings. I'll include that bit here. The initiative to provide each of the arch stones with a deep relief carving originated with Daniel Herbert. 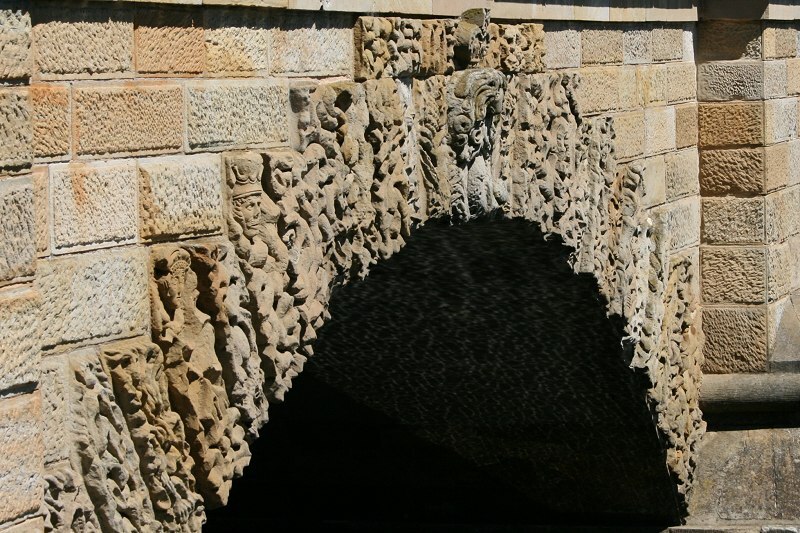 It is most striking that, in amongst all the voluminous correspondence concerning this bridge, between the Lieutenant-Governor, the Colonial Architect/Engineer, the Superintendent of Convicts, the Inspector of Public Works, local settlers and the Superintendent of Ross, there is not any mention of these carvings. Herbert must have gained prior permission from Capt. Turner to sculpt these stones, and this permission must have been granted, at least verbally. Also in the Mercury this week, a story about the Ross female factory which is interesting. Last Tuesday we visited Somercotes, an old farming property near Ross. Now what makes this place worth posting about: it's not a house museum, it's a working farm with an assortment of outbuildings and an old homestead they're trying to maintain. So it has some rather interesting features. I did completely forget to get a photo of the whole house but there is one here or an older one. If you've ever been down to Hobart, you've probably seen it in the middle of a paddock just after the second turn off to Ross. Unless you are looking at the other side of the road. The estate was established by Captain Horton back in 1823, which is of course, a Long Time Ago. The focus then was on establishing the farm buildings and the house was constructed later, sometime before 1842. You might remember this photo of Ross from earlier in the year. It was taken in February. Now, here it is again, in August. Quite different. Yes, there's no hay or sheep! with an empty house in it. A side trip, to the hill behind the older part of town. The Ross Bridge is on the southern access road, although once part of the highway. It was built in 1836, at the request of Lt Gov Arthur, and is another design by architect by John Lee Archer (maybe I should add a tag for his creations?). The two men responsible for building it, as both stonemasons and overseers, were highwayman Daniel Herbert and burglarJames Colbeck. Herbert's name is still well known Colbeck though has faded into relative obscurity, and when he does get a mention, he's often called John. Both did get a pardon a few years latter though. 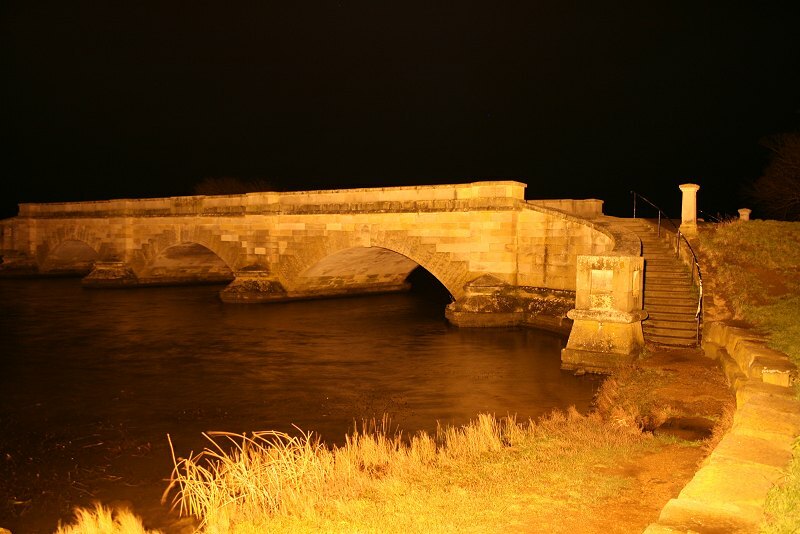 The best known, and probably most photographed, feature in Ross is the Bridge. As there are so many photos already on the web, you can look at them instead of me putting some up. Along Bridge St, being the street leading from the Bridge. Military Barracks. Ross sits beside the Midlands Hwy, not quite halfway between Launceston and Hobart, and just south of the Line. At the time of the second settlement in the north, the island was divided into two: Cornwall in the north, Buckingham in the south. Folk history puts the line along the 42nd latitude, and Ross is at 42°01' S. Nowadays, the (unofficial) dividing line between north & south is at Oatlands, the next town down the road. With a settlement at each end of the island, there was soon travel between north and south. From Highway in Van Diemen's Land, by Hawley Stancombe, "Wentworth wrote in 1819 of the track between Hobart and Launceston worn by carts and stock regularly passing between the two towns, but winding about so much that it was probably a hundred and sixty miles long. [Today it's closer to 124 miles] Major Thomas Bell of the 48th Regiment was therefore commissioned in 1821 to construct portions of the road from the capital to Port Dalrymple." 1821 is the same year, according to Parks & Wildlife, that Ross was a declared a town, although there'd been a garrison there from a few years earlier.